MineWhat.com compiled data to provide insight into what motivates shoppers. ‘Tis the season for online shopping. With Black Friday and Cyber Monday deals starting even earlier, shoppers are taking to the Internet to do their research and to find the best deals. But what sort of things stop shoppers from making purchases? 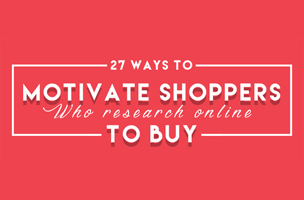 An infographic compiled by MineWhat.com provides insight into what motivates online shoppers. There are a variety of reasons behind why users choose not to make a purchase at an online store. Sixty-nine percent avoid purchasing because they believe returning a product would be a complicated process. Sixty-one percent of shoppers would leave a website if it didn’t have free shipping, and 51 percent would abandon a purchase if shipping options weren’t fast enough. Six in 10 consumers said they were concerned about credit-card fraud.